This acclaimed portrait of heroism and ingenuity captures a watershed moment in human history. The astronauts themselves have called it the definitive account of their missions. On the night of July 20, 1969, our world changed forever when Neil Armstrong and Buzz Aldrin walked on the moon. Based on in-depth interviews with 23 of the 24 moon voyagers, as well as those who struggled to get the program moving, A Man on the Moon conveys every aspect of the Apollo missions with breathtaking immediacy and stunning detail. Possibly the most riveting, moving book l have ever read. The author brings the passion of the apollo missions to life with magnificent detailed storytelling of the highest order. A detailed, accessible, fascinating narrative that unlocks the Apollo missions for everyone. Fantastic book and highly recommended for all. Probably man’s greatest accomplishment. Such a compelling and wonderful story. So sad mankind has virtually forgotten the important work done during this time. They envisioned putting a man on Mars by the early 80’s and would’ve done it. Now in 2019 and we’re not even close to that, history will judge us poorly for this. This is a magnificent read/ listen. I really enjoyed the first 3/4 of the book. The later missions (Apollo 15-17) weren't so much to my taste with a heavy emphasis on geology. I also wish there had been a few more lighter moments and humor. But all around a great story and performance. 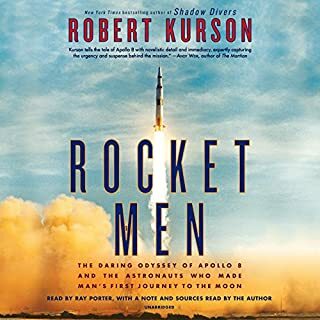 A breathtaking and inspiring account of the Apollo program from before the fire till the later careers of each of the astronauts who flew on it. A fantastic book. 10/10. Will listen again. Great performance by narrator also. The book is written in an emotive way that is perfectly captured by the emotive narration. The book is exciting in the first half where it recounts the end of Gemini and up to Apollo 13. Then the last bit is interesting when it recounts the scientific and geological explorations of the later Apollo missions. The narrator even manages to make geology kind of exciting. If you've ever been interested in the Apollo program you can't go past this book. If I had to choose one book that my descendants had to read I'd choose this one. 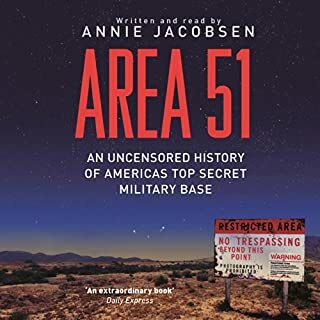 Andrew Chaikin truly allows the listener/reader to get to know the astronauts, the time and the world that the astronauts and NASA lived in. 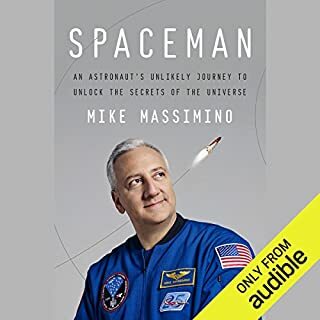 The narrator perfectly portrays the emotions of the author and the astronauts while also putting in a great performance including his portrayal of a southern accent. 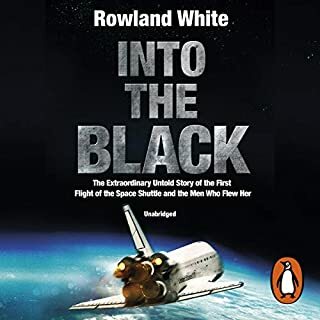 I cannot recommend this book enough, if you love spaceflight with me then this is the pinnacle, if you love non fiction or history then this is still a must. 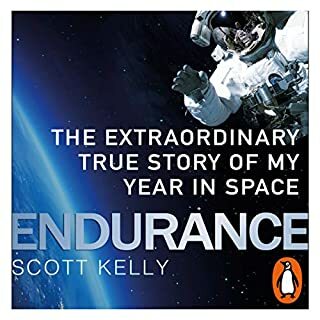 And if you have a hope for the future of humanity and spaceflight then this book will give you an insight into the human ingenuity that goes with it. Would you try another book written by Andrew Chaikin or narrated by Bronson Pinchot? Has A Man on the Moon: The Voyages of the Apollo Astronauts put you off other books in this genre? Do you think A Man on the Moon: The Voyages of the Apollo Astronauts needs a follow-up book? Why or why not? Nice idea, but the astronauts are almost uniformly dull and inarticulate. All good and brave guys which is what you need for a spaceship but not to listen to. I guess this is a useful insight, as is the ingenuity and dedication of the backroom staff but the book sags after the novelty of the early flights and the drama of Apollo 13. After that it is all rock collecting. Only Neil Armstrong (thank goodness he was first) stands out as an interesting if reticent personality. This book chronicles the full set of Apollo missions. It is very broad in scope, which is both a strength and weakness. There were many times that I wanted to know some of these astronauts more deeply as people, and other times I wanted more scientific detail. I realize, though, that the book that gave what I wanted might have been 2-3 times as long, and it already was more than 20 hours! Still, a number of the astronauts were profiled in depth, and this book is full of interesting scientific detail. It is cool that it covers the whole Apollo program. There were so many great parts, with even the slower moving pieces still interesting and easy to listen to. It is hard to write a great book which covers so much, and Chaikin did a pretty good job of it. 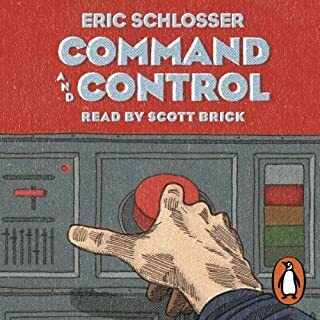 I quit many audiobooks from boredom, but this had my interest throughout. 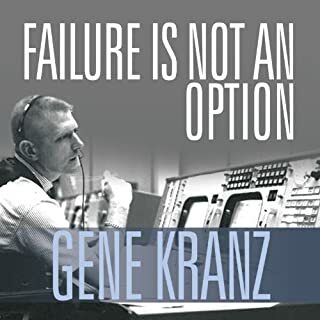 One other flaw - it felt like the author tried to minimize anything negative about the astronauts, and it had a little bit of a sanitized feel to it. I didn't mind because these astronauts were pretty heroic. Overall, this book was interesting and uplifting, and had a great narrator. I will look at the moon differently now. What did you love best about A Man on the Moon: The Voyages of the Apollo Astronauts? Chaikin's approach to the book, which isn't a straight history of Apollo. This is not a dry, dusty history, but rather a character-driven exploration of the program, with all of its brilliant successes and heart-breaking failures. Nor is it hagiography. The Apollo astronauts are real people, with all the flaws that that entails, and Chaikin does a great job of capturing their strengths as well as their weaknesses. Though not a "character" in the literary sense: Pete Conrad. The chapter on Apollo 12 is my favorite. Superb inflection and a recreation of the astronaut's speaking styles. Pinchot's reading was very nicely done and he does a great job of capturing the personalities of the astronauts. He doesn't try to do impressions, though. It is his interpretation of the astronauts, but accurate ones if you've ever heard one speak. Yes, but I'm a manned space flight nerd. Your mileage may vary. I really enjoyed every bit of the book. I've craved something that went deep; but I also wanted lots of details, yet a good story. This book delivered them both! This is the only book where I really felt like I was part of the story - I really felt as if I was there - with the astronauts - on the moon!! No other astronaut book gives you that kind of depth and intensity. The narration was top-notch and really helped move the story along. For anyone wanting a complete retelling of the Apollo program there is no better book. This book is a fascinating fly-on-the-wall panorama of the extraordinary efforts made by NASA to land a man on the moon before the onset of the year 1970, and then the subsequent missions in the early 70s. You look up at the big moon in the sky and it doesn’t look all that far away, but if the earth was a basketball, then the moon would be a baseball a distant 23 feet away, or a quarter of a million miles to full scale. And the technology available to get the astronauts there (and back) was fairly rudimentary by today’s standards; all foil, duct tape and steaming, simmering rocket fuel. The computer on board Apollo 11 contained less hardware than a pocket calculator, with a paltry 64 kilobytes of memory. 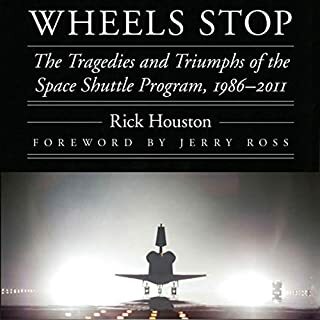 This book takes you through all the missions leading up to the 1969 moon landing (and beyond), and it becomes clear that the men inside the rockets were taking a very big risk every time they sat on those colossal vats of liquid hydrogen and got blasted into space. Manoeuvring out of earth orbit and then into lunar orbit required very precise burns of this rocket fuel to alter their speed and direction, and if these were miscalculated or if there was a malfunction, then they would have drifted into the blackness of space until their oxygen fizzled out, like Major Tom. And the glamour of space flight loses some of its gloss when you hear the graphic descriptions of globules of urine, vomit and diarrhoea meandering randomly around the cabin. 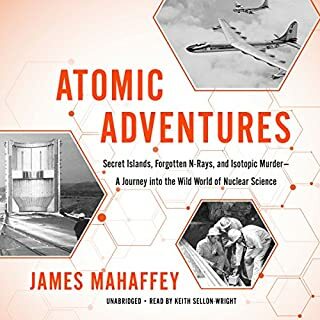 After several days cooped up inside the cabin the smell got so bad that one navy swimmer who released the astronauts from their command module in the Pacific Ocean wretched when he opened the hatch. But there is also the sheer amazing exuberance of that first historic walk out onto the lunar surface. With Armstrong and Aldrin; two serious, highly intelligent and rigorously trained aviators bouncing around in the moon’s one sixth gravity like toddlers on a trampoline, and the surrealism of them being so ridiculously far away and so isolated, and yet being watched by 600 million viewers on live TV and having a phone chat with President Nixon. It’s so bizarre that it’s no wonder there are some cretins who think the whole thing was a hoax. Like the moon, this story waxes and wanes in cycles of climax (the first moon landing and the Apollo 13 near-disaster) and anti-climax (Apollo 12, the second moon mission and Apollos 14-17, when moon geology becomes the main focus and the Apollo programme just gradually peters out). 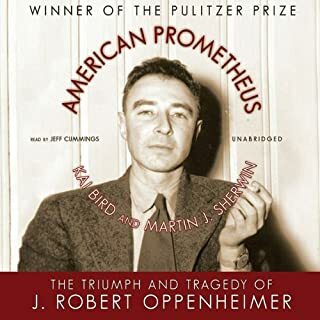 But despite these anti-climaxes, the audiobook tells the full story in rich detail, and you really feel as if you were there on the moon with those first pioneers. Recommended. 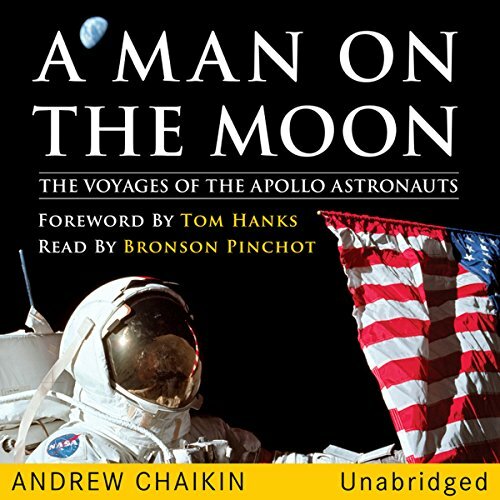 Would you consider the audio edition of A Man on the Moon: The Voyages of the Apollo Astronauts to be better than the print version? I do not know the print version. I cannot say. What was one of the most memorable moments of A Man on the Moon: The Voyages of the Apollo Astronauts? In spite of my familiarity with the Apollo 13 movie, I still find the all out efforts of the "backroom experts" at Mission Control and their construction of the adapter to use the Command Module carbon dioxide scubbers in the Lunar Module to be moving. Which character – as performed by Bronson Pinchot – was your favorite? Fred Haise in the calculation of what was necessary to get back home after the explosion on Apollo 13: oxygen, cooling water, electricity. Though Jim Lovell was also important in that same interplay. In truth, each of the several astronauts were well-portrayed. While Bronson Pinchot performed them superbly, he could not have breathed reality into the characters had it not first been well-written for him. The phrasing in this book is like a Frank Sinatra song--pleasantly conversational but conveying great meaning economically. 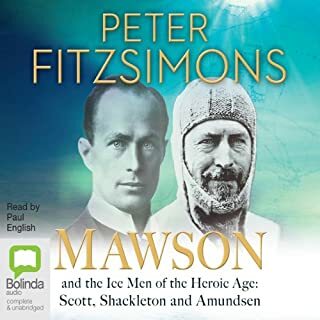 I really enjoyed the writing and Mr. Pinchot delivered the characters. I was born in 1957. I followed the march into space from Yuri Gagarin's embarrassment of NASA by beating the US in manned orbit, to the end of the Apollo missions with an enthusiasm only an adolescent boy can muster. This book rekindled a pride I felt then. What is amazing is that in spite of my fixation and voracious consumption of everything that was available then, this book gave a whole new perspective. I cannot say enough to praise the superb story laid out here. The depth of emotion conveyed is such as to give a clear view of, for example, Marilyn Lovell, in a manner that evokes empathy even now. I found myself swelling with pride in the astronauts in spite of the foibles that the book displays. These were high egos reaching for an elusive brass ring. But it was egos that drove success. This is a good book. This is an outstanding story with excellent narration! Each vignette about the different Apollo episodes was a great story in itself. The book inspired me to find and watch YouTube videos on each of the launches. Very inspirational!!! The story is epic and expertly written by the author. Some technical details, yet more of the human factor - stories and anecdotes that bring the men of the Apollo program to life. Author employs a somewhat too dramatic reading style that at times is completely at odds with the written material. Still, his style is decent enough and does not subtract too much from the experience. 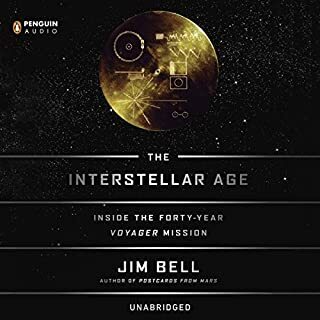 Overall a wonderful audiobook that I can highly recommend to those curious about the manned missions to the moon, or to anyone with an interest in magnificent tales of courage, ingenuity and exploration. As a child growing up in the 60's I experienced the moon missions on TV, and back then they seemed "nominally" great. But now, as an adult, listening to this book, this audacious feat, the details, the human side, all add up to a story that is beyond amazing. No one astronaut stood out, but the ones with a Texas drawl were my favourites. Great tone, a "welcoming" story teller. No, too long to listen to in one sitting. 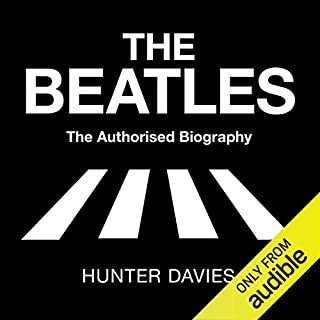 Just as Steve Jobs once said when developing the iPod, "music is transformational", audio books are very much transformational as well. If you have a hobby as do I (building RC airplanes), you can enhance your hobby with audio books. I have been very pleased with this new experience. Wonderful account of the Apollo program. An excellent and detailed work on the history of the NASA moon program. 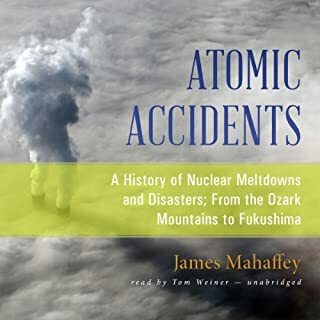 Good narration, and the author is obviously educated (and enthralled) about the subject. This three-volume set was the primary source material for HBO'S miniseries From the Earth to the Moon. I've listened to various books detailing the glory days of American space flight looking for the one that would tell the story of the Apollo missions with just the right balance of technical detail, human warmth and...awe. I know that the Apollo astronauts least favourite question was 'What was it like up there?' but of course, I still want to know - and Andrew Chaikin does a fantastic job of telling me. If you're going to listen to this book here's a tip - search Google for 'Apollo Lunar Surface Journal' on your web browser while you do. It contains every picture from every mission plus word-for-word transcripts of the entire journey. Break out and immerse yourself there and in the full-length capsule recovery videos on YouTube...then come back to the book - you won't regret it! 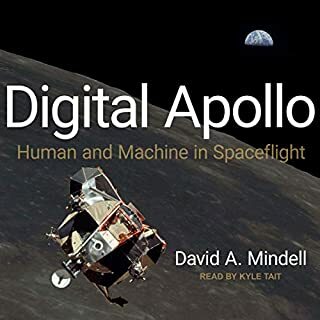 This book sheds so much light on the Apollo story... it's technical without being boring, and it captures the essence both scientifically and at a higher, human experience level. This is an excellent book! Exciting history and the story is told in such a way that you even feel part of the adventure, I loved it! 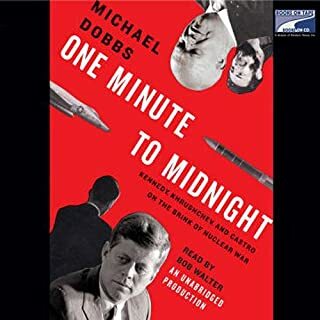 A great book, well narrated. Its a shame that all that blood, sweet and tears has come to nothing. This is a truly fantastic story about the best humanity has to offer. The subject matter is so well put together it captures the momentum of the space race. 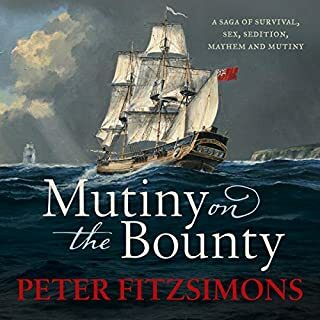 It's written and narrated in such a way as to be thuroughly engaging and I will be listening again very soon. Great history into the Apollo programme! Well told, good narrative throughout, and amazing story. 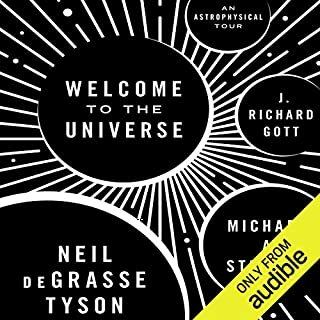 This audiobook definitely inspires the want to be space adventurer. Well worth a listen! This really brought the Apollo programme to life. I was nine years old when the first manned lunar landing took place. This brought it to life. Well researched and written. The story from overall context to fine detail, with the compelling human stories brought this to life. I felt like I had travelled in space!